Combi Coffee in Elwood has a relaxed beachy feel to it, so much so that while enjoying a coffee there one day, I heard a customer exclaim "I feel like I'm on holidays when I come here!" The cafe is quite small with a three or four tables outside. It's a great place to go to on your own with the paper or with a friend for a good catch up. On Saturday mornings it can be a little too busy so I can recommend grabbing a take-away and walking to Elwood Beach, which in only a five minute walk away. On a clear day, Elwood Beach looks really pretty and while it may be hard to swim in Port Phillip Bay without thinking of dead bodies and other people's garbage, it's still a good place to go when temperatures reach unbearable. 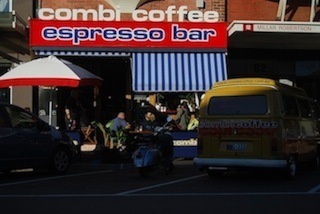 Combi Coffee also sells Keepcups which are a great way to minimise waste if you like to drink take-away coffees often. Combi Coffee uses fair trade organic beans and the coffee is always perfect.